Let’s face it, most people don’t think about what type of lock they have until there is a problem. Don’t wait until there is an issue, learn why deadbolt locks might be the best option for your home or business. You can enjoy an added level of security with premium-quality deadbolt locks from South Austin Locksmith Pros. Whether you’re looking to install new locks, replace older ones or have existing ones repaired, we’re your trusted source for a 24-hour company for all of your lock services in the area. Licensed, bonded and insured, we’re a proud local company with a history of actively being involved within the communities we serve every day. Regardless of why you’re calling on us, expect us to arrive quickly to assess the situation, offer solutions tailored to your budget and ensure everything is done right the first time. Still Not Sold On Deadbolts? A deadbolt lock is a type of lock that is not activated by a spring, allowing for added protection since locks of this type cannot be “picked” open or jimmied open. Deadbolts also provide an added entrance barrier if the other lock on the door is manipulated. Single-cylinder: Typically used on doors with no breakable glass near the thumb piece, this type of deadbolt is opened with a thumb piece on the interior side and a key on the exterior side. Double-cylinder: Keyed on both sides, these deadbolts are recommended for use on doors with breakable glass close to the knob. Keyless-cylinder: Easy to operate, these high-tech deadbolts can be opened with a fingerprint scan or preset password. They can also be operated with a knob or button. Our mobile team will take care of all the necessary steps to successfully complete a new deadbolt installation. From taking precise measurements for placement to securing the strike plate, no detail will be overlooked. We will make sure you are fully aware of the price before we begin work and we’ll even make sure everything is neat and clean before leaving. No lock is entirely tamper-proof. However, our trained experts can install a deadbolt that is “bump proof,” meaning it cannot be picked with a bump key, for your added protection. How much do deadbolts cost? They generally range from $20 to $50, depending on the type you prefer. Our technicians will help give you the information you need to make a decision that’s right for you. Do deadbolts have to be located adjacent to the other lock on the door? For mechanical and aesthetic reasons, it’s best to place a deadbolt next to the primary lock, although you can opt for a double-keyed deadbolt if you have door glass near the lock. Whether you’re looking for a residential or commercial locksmith in South Austin Texas, we are at your service. Call today to learn more about our deadbolt installation and repair solutions. 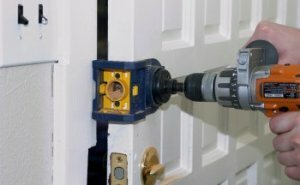 Deadbolt Locks https://south-austin-locksmith.com/lock-services/deadbolt-locks/ 3.8/5 based upon 20 reviews.